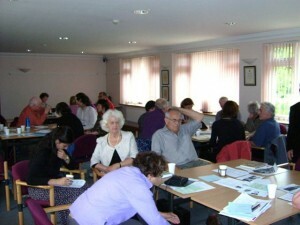 We gathered at one o’clock at Park House in Leatherhead for this ‘expedition for beginners’, organised by Diana Webb. There were fifteen BHS members, one ex-BHS member and sixteen other interested people, in groups designed to have an equal mix. Diana provided a very useful set of notes for everyone. This included quotations helpful in encouraging an openness to and awareness of special ‘moments’. There were also 24 haiku as examples for beginners and some extra notes on generally accepted features of what haiku should be. Having read these with a bit of discussion we were ably guided by Tony Marcoff on a walk beside the mill pond and around marshy meadows. Tony, like Diana, is a resident of Leatherhead and was able to supply interesting information on the walk and the town. 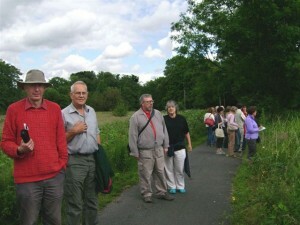 The pace was perfect for walking, talking, jotting and identifying the flora. Then back to Park House for rest, refreshment and further jotting. 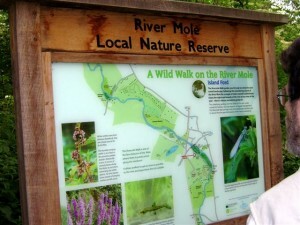 The second walk headed over the bridge and along the river Mole. On this stretch there were small weirs and wooded islands reminding me how very green Surrey is. 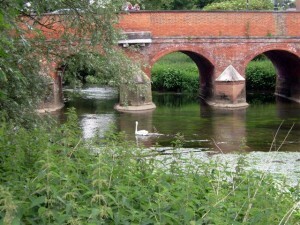 Remarkably, all this is very close to the centre of Leatherhead – a wonderful resource for the inhabitants … and us. Crossing the river we headed back along a road for a short way and then through a magical sloping garden with lavender lanes running down to the river again. One particular spot gave the best view ever along the river with a weeping willow in the distance. In the evening about forty people gathered in the Green Room of Leatherhead Theatre. Firstly eight of us read our own mid summer haiku in turn, interspersed with the sounds of the flute (Steve Mason) and various other musical and percussive instruments. This was followed by a programme of readings from fifteen BHS members including haiku, haibun, renku and tanka. The evening ended with expressions of pleasure from the audience and some addresses were exchanged. Diana’s organisation and Tony’s sensitive guidance made the afternoon and evening a very pleasurable experience and a great success. On Sunday seven of us walked to Bockett’s Farm, a place where the public can see the working of a farm more closely and meet the animals. We passed fields of cultivated elder bushes and had good views over the valley. We walked back a different way and after a pleasant time in a pub garden we parted company, well pleased with the weekend. Diana informs me that of the 32 people on the afternoon walks, 26 have so far sent her haiku written on, or from the experience of that day. She hopes to put together a small booklet to catch the sense of that particular afternoon on the footpaths around Leatherhead. This would include one haiku per person from everyone who has sent some in.